US Citizens in Israel; Have you filed the FBAR? Tomorrow, June 30th is the deadline for filing the 2008 "FBAR" (Report of Foreign Bank and Financial Accounts) to the US Treasury. Honestly, I'd never heard of this before -- I have been filing IRS taxes for years, though as an Israeli citizen paying taxes here, the US/Israel dual taxation treaty meant I rarely had to actually pay the IRS anything. Yet while the FBAR is nothing new...it was rarely filed by people and the IRS never went after you for not filing it. 1. Congress recently linked the requirement to file the FBAR to the U.S. Patriot Act, making the failure to file a criminal offense in addition to a civil offense. This is a serious change. 2. President Barack Obama is making good on one of his campaign pledges by promoting the more strict enforcement of tax laws. 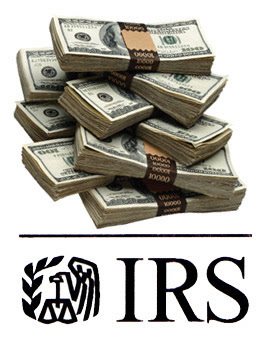 Starting with the 2008 FBAR, the IRS is enforcing policy of going after those who don't file. Section 5321(a)(5) of the American Jobs Creation Act of 2004 imposes penalties of up to $10,000 for nonwillful failure to file the report or disclose foreign accounts. Whereas this sanction has not new for 2008, the IRS has announced that it intends to enforce penalties for FBAR noncompliance. "Nonwillful failure" means that simply not knowing about this form is still reason enough to get in big trouble. 3. The mailing deadline for 2008 FBAR forms is JUNE 30, 2009 – and unlike regular IRS tax forms, no extensions are granted. Unless you want to spend some quality time in Guantanamo and a hefty fine of 10 thousand dollars, I seriously suggest you discuss this with your CPA and file the report in the next 24 hours, if you haven't already. As Treppenwitz always says -- "don't thank me...I'm a giver"
Hi Readers! Yes, I'm still sick, but getting better slowly -- I've felt so ill I couldn't even post for a week. Yet the following came along today and I was so annoyed, that I broke out of blogging convalescence and had to get this message out to you. Rabbi Yochanan Wosner, a dayan in Montreal, Canada, is conducted a fundraising campaign for Elior Chen, who is wanted in Israel for running a child abuse cult that has left a number of children injured, and one in an irreversible coma. Chen ran off to Brazil, in the hopes of avoiding extradition. Now, Rabbi Yochanan Wosner of Montreal is helping Chen, claiming that Chen was set up. In fact, the prima facia evidence is overwhelming and Chen is fighting extradition to Israel, since he knows that the case against him is open and shut. In the meantime, Rabbi Wosner encouraged Chen to escape to Brazil and has initiated a campaign to raise money for the alleged cult leader. Fellow Jews. Have mercy on the victims of Elior Chen. Express your outrage that a rabbi in their community (who sits on their Beth Din: http://www.mk. ca/dintorah.html) is aiding and abetting a suspected abuser. The number for the Beth Din is (514) 739-6363. Here's a good background link from the JPost where Chen's bio is: "An Israeli fugitive who is considered to be the ringleader of - and 'spiritual mentor' responsible for - one of the worst child abuse cases in Israeli history." People: When the forces of good go after child molesters or child abusers -- communities need to support them, and not have fund raising rallies for monsters. Did the honorable Dayan Yochanan Wosner ever visit the hospitalized comatose child? Did he speak to the Israeli Police to see what the facts are? Does he care? Haven't there been enough Lanner and Kolko cases around the planet for this problem to go away? Do the right thing -- get the word out on your utter disgust that the Dayan Woser is publicly trying to help this silmeball Chen. Here's some source info (in Hebrew, with posters and the Dayan's letter on behalf of Chen) that's going around London's Chareidi Communities. What does Natural Growth mean to you? I guess sometimes its easier to keep your head in the sand than accept the plain and simple meaning of what is being told to your face. A perfect example is in a recent Q&A session with Obama's envoy George Mitchell (a low level functionary hack, I presume). As everyone knows, Obama has been demanding a stop (destruction) to both Settlements as well as an end to 'Natural Growth' (among other demands). With the English language being stretched and warped so manipulatively by the Obama administration, some reporters have tried to pin down what exactly does 'Natural Growth' mean. What exactly does the Obama administration see that they are trying to stop? Here is an except from that Q&A session. The only question the reporter didn't ask, is if the administration's preferred method was gas or drowning. QUESTION: -- including natural growth. And secondly, can you give us just a definition of what the United States considers natural growth? What does that phrase mean in your mind? MR. MITCHELL: I’m constantly asked by editors, you know, please give a plain explanation of what natural growth is. Well, of course, one of the issues is that there is no universally used and accepted definition. The most common definition is by the number of births, but there are many variations of that. I’ve had numerous discussions with many Israeli and other officials, and there are almost as many definitions as there are people speaking. But I think the most commonly used measure is the number of births. MR. MITCHELL: The one that – the most commonly used in conversations with me. QUESTION: -- is that what it’s saying is the definition? MR. MITCHELL: We’re engaged in discussions on a wide range of issues. And different people have different interpretations of different phrases. And we listen to all points of view. We listen to every aspect of every discussion, and we’re trying to reach an agreement and understanding that helps us move the process forward. And I think I wouldn’t want to get beyond that. "But I think the most commonly used measure is the number of births." Has he made the Obama position clear enough? Dov Bear and other far left bloggers publicly lambasted and attacked Jameel and I for a post where we reported that on Israeli Radio they said the Obama administration will be announcing a major peace initiative in July. The reports indicated that the initiative will include removing Jewish sovereignty over Jerusalem. But Dov Bear and others misread the post and report (by accident I'm sure) to mean that Obama would announce his initiative in his Cairo speech - which is not what we said, and obviously not what happened. Funny how life works, because in this same Q&A session, as it happens, that exact question came up for Mitchell. QUESTION: Samir Nader with Radio Sawa. Mr. Solana of the EU, he stated a few days ago that the U.S. will announce its vision for peace in the Middle East before the end of July. Is this true? And if so, will you do it now? MR. MITCHELL: Is this before the end of July? As I said earlier, we’re going to move as promptly as possible. And in my opening remarks, I said that we hope to conclude the discussions in which we’re now engaged very soon. To me, it’s a matter of weeks, not many months, so he may well be right. I don't want an apology from Dov Bear for being wrong again. Dov Bear, I am not interested in fighting with you about all this - on what the grammatical structure of Obama's statements mean. I am sure we will continue to disagree on that. The Obama administration is not the Bush administration which had tacit agreements with Israel in place and where George Bush personally had respect for Israel (even if Condi and his other advisers didn't). Stop trying to compare them. It's irrelevant to what is at hand. The issues is the present and the future. At some point, Obama will begin to transform words into actions (and it has actually already begun). I just want to know that you will be on our side if and when push comes to shove. Everyone, please wish a Refuah Shleimah to Jameel who has been out of commission this past week. Doctors have ruled out Swine Flu (seriously), but he is ill with a high temperature and is unable to blog or much of anything else. He appreciates all your good wishes. I suspect they must have wanted to run this campaign ahead of Shavuot. On the other hand with the 3 weeks and 9 days coming up, and people looking for non-meat recipes and products to cook and eat, maybe their timing was right after all. Tnuva just launched their new (and very extensive) website. The site has product coupons. Locations throughout the US where their products can be bought (stores and addresses by city and neighborhoods). And their entire product line (with pictures)v- and let me tell you, it looks like you can get a lot more Tnuva products in America than we get here in Israel! (That's just not right). And obviously all the products are Chalav Yisrael. One can't forget all the recipes and tips. 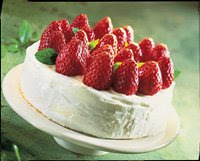 Mix the cheese, egg yolks, flour, pudding, sour cream, and 1/2 cup sugar. In a separate bowl, whip the egg whites with the remaining sugar until stiff. 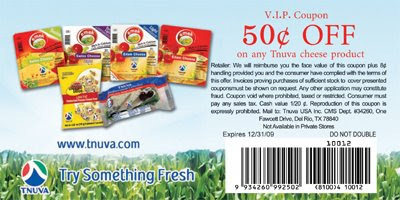 So look for the Tnuva logo - and visit the Tnuva Website. Will the State Department Convince us of His good will? Last week the Jerusalem Post published a poll indicating that only 6% of Israelis consider the Obama administration pro-Israel, and 50% consider his policies pro-Palestinian. A mere 36% considered the White House neutral. Assumed to be responding to the poll, and apparently speaking for the White House , NSC's Mike Hammer (Mickey Spillane?) responded last week that the White House "remain committed to peace and security for Israel". I guess that should have convinced us of His good will. Except yesterday, a reporter forced State Department Spokesman Mr. Ian Kelly to clarify what Obama includes in his definition of settlements. QUESTION: On Israel, I was wondering what your reaction is to the new Israeli budget that puts tens of millions of dollars for new construction in Ma'ale Adummim in the West Bank and Har Homa in Jerusalem. MR. KELLY: I’ll see if I can get you more information on that. QUESTION: -- does that include any Jerusalem neighborhoods that are over the green line? MR. KELLY: That – we call for a cease to all settlement activity. QUESTION: Including Jerusalem in that? MR. KELLY: We’re talking about all settlement activity, yeah, in the area across the line. In case you don't know what "in the area across the line" refers to, that means not just Har Homa, but also Gilo, Abu Tor, Armon HaNatziv (East Talpiot), The Atarot airport and industrial zone, Pisgat Ze'ev, Ramat Eshkol, Ramot, French Hill, the Rockerfeller Museum alongside the Old City, the Mount of Olives, and of course the Jewish Quarter in the Old City of Jerusalem (and the Old City itself) and the Kotel (I assume we can keep Hebrew U, but will we be allowed contiguous access?). 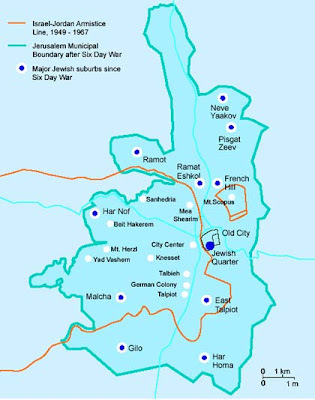 All those neighborhoods are over the Green Line and within Jerusalem. All those are neighborhoods are where Jews are living "settling". At this point, I would point out that its absolutely clear that the US position to destroy settlements is not restricted to homesteads, towns, villages and cities like Sdei Boaz, Shdema, Migron, Efrat and Ma'aleh Adumim, but rather, the US has declared war against the Jews of Jerusalem itself. There are a ridiculous number of serious traffic accidents and fatalities on the roads in Judea and Samaria, the majority of them involve Arab drivers driving at high speeds or dangerously. That the Arabs are involved and the cause of the majority of the traffic accidents is well documented (and this includes Arab-on-Arab accidents). But with so many accidents one would think that something would be done to reduce the insane speeds these Arab drivers drive at on these roads, so as to reduce the accidents and fatalities. In fact that has been attempted. 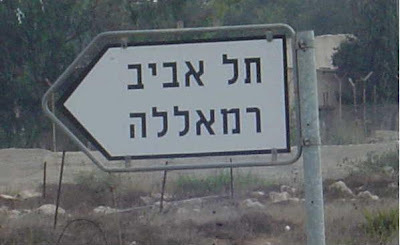 The Gush Etzion council has been fighting to install a traffic circle on the Tekoa-60 road just before Efrat (where many accidents happen) as well as on the 60 road. These traffic circles would save lives (primarily Arab lives in fact). But installing the traffic circle on Tekoa-60 would require the appropriation of a few meters of empty, undeveloped and unfarmed land along side the road that happens to be owned by Arabs. Furthermore, the traffic circle on 60 would completely alleviate the traffic jam that primarily affects the Arabs from Beit Lechem traveling to Hebron (as well as removing their risk of driving into oncoming traffic - which has killed and injured more than a a few of them). Peace Now weighed the value of an Arab land-owner being forced to sell a portion of his land alongside the highway so a traffic circle can be installed, to be of higher value than building a traffic circle that would save many lives (particularly Arab ones) and prevent serious traffic jams – and this went as far as the Supreme Court. What a strange value system they have. Meanwhile the land stays empty, and the deaths build up and Arab traffic piles up. What have they really accomplished? It is Haveil Havalim time. Take a moment to check out the latest edition of the Best of the Jewish/Israeli Blogosphere. You can find the latest edition right here. Want to help us with some market research. Our dear friend and intrepid blogger Jameel never misses an opportunity to work on building his empire of waffles and more. At the moment he is away doing some market research and analysis, but perhaps we can draw upon the wisdom of crowds and offer some help. Actually I can assure you that Joe Settler and I would really appreciate it as we're bone tired and weary of working on the various secret Muqata projects. At the moment we are preparing some new marketing materials for a line of t-shirts that will be sold throughout the J-Blogosphere. So friends, have at it, what do you think we should add? Joe and I have a few ideas, but let's see if you take it in the same or a different direction. I know everyone has gotten used to a few posts everyday, but Jameel was sent away on a secret mission this week (which he may (or may not) talk about when he returns), and I'm just super busy right now. So hold on tight. Jameel returns in the middle of next week - hopefully with tons of cool pictures. I'll try to post if something important happens (or if I can figure a way past Jameel's moratorium on anti-Obama posts). Israel confirms (though Hamas still denies it) that Gazan Palestinians attempted to assassinate former US President Jimmy Carter during his visit to Gaza. Carter was warned in advance that their might be an attempt by a group connected to Hezbollah. Hamas denies any connection, and say they didn't find any bomb. Israeli sources say the bomb was disarmed before Carter's convey reached it. JoeSettler is proud to be writing the 2000th post on the Muqata! Former US president visits Hamas-controlled Strip, says he feels partly responsible for destruction caused during Israeli offensive by bombs dropped by USA manufactured F-16 planes. Carter demanded that Israel "lift a blockade on the Palestinian enclave and stop treating its residents like "savages." "I am very affected. I must hold back my tears at seeing the destruction that was inflicted on your people," he said. Barely reported, but Israel confirmed reports that there was a failed assassination attempt against Weepy Jimmy today in Gaza. A roadside bomb was found and diffused by Hamas forces minutes before Carter's motorcade was due to pass along side it, in Gaza. Yesterday in the comments section Lurker said the entire Netanyahu speech was an unmitigated disaster for some very simple reasons. Lurker said that Netanyahu can add whatever conditions and prefixes he wants, but (a) the world will ignore them, and (b) the PA is going to do what they want, and we won't be able to stop them, and no one else will care. The world only heard the words "Palestinian State", and absolutely nothing else in the speech. And Lurker continues, there is no possible way a "Palestinian State" can or will be demilitarized, and "on the other hand", pressure will continue to be placed on Israel to take additional permanent and irreversible steps, regardless of what the other side does or doesn't do first- and unfortunately, once again Lurker is turning out to be right. Obama once again demanded the "a cessation of settlements" (that means their destruction for those who aren't sure). And Obama has placed Arab incitement to terror (and terror itself) at the same level as Jews living in their homes. A very disturbing example of immoral equivalence. Furthermore, Obama once again gave his tacit recognition of Hamas, "On the Palestinian side, whether it's the Palestinian Authority or other groups like Hamas that claim to speak for the Palestinians...". And of course in parsing what is a "continuation of settlements", Obama says, "if you have a continuation of settlements that in past agreements have been categorized as illegal, that is going to be an impediment to progress". Uh-huh, except that this is more double-speak and Historical Fiction from Obama as there are no past agreements that do that. To begin with, Settlement activity was never categorized as a violation of the Oslo accords. And neither the Wye River Memorandum, nor the Interim Agreements (Oslo II) categorized it as illegal either. So what past agreements does he mean? He can only be referring to the Mitchell Report and the "Road Map" which the US tried to impose on Israel - in which Israel openly rejected the parts it disagreed with. Israel only agreed to discuss a settlement freeze and illegal outposts, not impose one or agree to destroy them. "Among issues not to be discussed: settlement in Judea, Samaria and Gaza (excluding a settlement freeze and illegal outposts);". Certainly Obama is sending the message that any Israeli statements about points it doesn't accept (both in the past and future) are irrelevant and meaningless, and an "agreement" is whatever he chooses to impose on Israel. So now we need to understand which settlements does Obama see as illegal as per "past agreements"? Because as we know, there really are no past agreements that say so. On May 27, Hillary Clinton explained Obama quite clearly "He wants to see a stop to settlements - not some settlements, not outposts, not 'natural growth' exceptions.". That's rather unequivocal and doesn't leave much room for debate. And after all, the EU and the Palestinians openly declare ALL settlements to be illegal. Does Obama mean agree with what the PA and EU say? It would appear to be so. Suddenly Obama's double-speak becomes abundantly clear. But just as disturbing is the Jerusalem Post report on the latest dispute with the PA.
Russia donated 50 heavily armored APCs to the PA through Jordan. The PA was apparently expecting to receive them with 50 heavy machine guns attached to them (or to be allowed to attach them). Israel balked at that and said no. So now the PA is saying that they will only accept them if the mountings for the guns are already attached (they can hook up the guns later at the garage). And so, the farce of a "demilitarized" Palestinian state continues, and it looks like Lurker's analysis of the fallout was 100% right. I would also recommend reading this article by Dore Gold. And this one by Elliot Abrams. 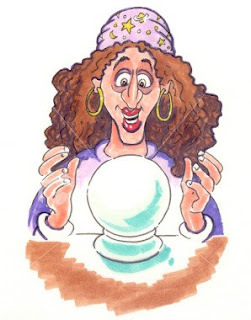 All of Israel's astrologers, mystics, numerologists and crystal ball readers failed to predict yesterday's nationwide Tax Authority raid...on the professional fortune tellers, themselves. The raid included all of the above, included Homeopathic, Chinese medicine and holistic "healers", as well as those who arrange marriages...shadchanim. Armed with detailed intelligence briefings from newspapers and the internet, the tax authority executed their plan like a military operation. In one case, a tax authority undercover agent approached an astrologer, requesting help to predict the future for her business opportunities. The agent paid for the "service" and received a receipt without any details of the service she received. The astrologer was then investigated and found not be be keeping her financial books, "in order." In another case, an agent pretended to be "single" and looking for a marriage partner -- he approached a "shadchan" marriage-broker, paid hundreds of Shekels, and received a list of potential prospects. The agent also had to sign a document that in the event a marriage ensued, he would pay thousands of shekels to the shadchan. Wouldn't you have thought that at least one of the astrologers would have foreseen the raid? As I mentioned car taxes in Israel will be going up. Purchase tax on cars (and separate from VAT) are expected to be raised from 77% to 92%. Fuel taxes have been rising too. On the other hand (a term that implies direct comparison between the two juxtaposed expressions, i.e. see Obama's Cairo speech), taxes on Hybrids will be reduced from 77% to around 30%. But no luck yet the government will actually offer incentives to buy them as opposed to just reducing an extra tax. Now I can only hope that they start importing Hybrid minivans, so we can accommodate any future Natural Growth in the JoeSettler homestead. I told President Obama when I was in Washington that if we could agree on the substance, then the terminology would not pose a problem. If we receive this guarantee regarding demilitarization and Israel’s security needs, and if the Palestinians recognize Israel as the State of the Jewish people, then we will be ready in a future peace agreement to reach a solution where a demilitarized Palestinian state exists alongside the Jewish state. In defining his vision of Peace, Bibi introduced no new substance, just new terminology. He restated his vision of “autonomy-plus” but this time called it a “demilitarized Palestinian state”. The question is, how important were his choice of words, and how should we respond to them? Has Bibi placed us on the precipice of another slippery slope like Madrid, where no one remembers the incredible things Shamir said, but only that he went there? Certainly Obama is satisfied that the taboo words were stated. Was the entire speech merely a delivery system for these 2 little words (3 actually, but already we see the world and Obama are ignoring the word 'demilitarized')? Will the US and the world now ignore the other 2966 words of the speech and exclusively focus on these two, without its basic prerequisites and fundamentals? It would appear that the rest of the speech has been lost in the void. It would appear that the world doesn’t even care to add the word “demilitarized” in front of it, and already consider it superfluous. It then behooves us and the Israeli government to take certain concrete steps ourselves to anchor ourselves and not let the slide begin. Bibi and the government must now be made to work to get all the EU countries, US Senators and Congressmen - and even Obama - to always add the word “demilitarized” in front of “Palestinian State”. And Israel must openly and forcefully never accept hearing it from them without the prefix attached. If unfortunately 'Palestinian State' is going to be added to the political lexicon, then the proper usage must be “demilitarized Palestinian state”, and nothing less. And our Israeli representatives must be Chutzpadik, as only Israelis can be, even to the point of interrupting a foreign official in the middle of a joint statement if that key word is mislaid. Nothing less will help block that slippery slide. Every single Right wing government since Shamir has been brought down by Right wing parties (in certain cases after shifting Left, in certain cases not). The Right (and of course the Left) are strongly criticizing Bibi right now for what he said, and international pressure and criticism is sure to follow quickly. The Right can either repeat the mistakes of the past and bring back Kadima and Meretz (imagine if it had been Tzippy Livni giving that speech), or it can strengthen Bibi on all the positive points he said (which would have been completely never mentioned or disregarded if Kadima was in power). The unashamed historical rights of the Jewish People to the Land of Israel, including Judea and Samaria (and unconnected to the Holocaust). His acknowledgment of us Settlers as brother, Zionists, and pioneers, and not enemies of the State, nor enemies of peace - perhaps his most important statement. His unequivocal statement declaring Jerusalem as the unified and undivided capital of Israel - forever. His support for continued growth of the Settlement enterprise in Israel's Biblical heartland of Judea and Samaria. He specifically said, "With God's help". When was the last time you heard a Prime Minister of Israel invoke the name of God. Until Netanyahu actually veers Left, and acts contrary to his stated positive positions in the speech, the Right has little to worry about, so long as it continues to openly support him against the powerful and overwhelming international pressure he is sure to face. And after a speech like that Bibi deserves our support right now, more than ever. I am far from an avid Bibi supporter, but his speech tonight, was by far the most Zionistic and refreshing speech made by any Israeli Prime Minister since Shamir spoke in Madrid (I remember that speech, and the Arab reaction, which was that it was the first time they ever heard that Jews had any history in Israel at all). The Right wing took out Shamir after Madrid. Please don't make that mistake again so quickly. I can say that I didn't completely agree with Bibi's vision, nor do I think the Arabs are capable of standing up to his challenge to attempt the the most basic of requirements that he laid out, that Peace demands, but it was a very good speech. I'm glad he so clearly corrected Obama on our history and rights to Israel - including Judea and Samaria. That was simply a pleasure to listen to. I'm glad he gave such a wonderful history lesson, but his best line is when he said he is going to use "simple words" (presumably so Obama would understand) to explain both our rights to Israel, and the core cause of the war - and how it has nothing to do with Israel in Judea and Samaria and how it began years before there even was a State or even an IDF. He made it clear that the Palestinians keep rejecting Peace, no matter what we offer and do. All we get is violence in return. Until the Palestinians are willing to simply say they recognize the State of Israel as a Jewish State that will continue to exist that way, there can't be peace. He said, you can't constantly demand everything from Israel, but even the most simplest demand, a vocal statement of recognition of the Jewish State, is not required of them - and they need to do that for peace. He continued that Palestinian refugees will not return to the borders of Israel. He recalled that Israel, with no resources, absorbed tremendous numbers of Jewish refugees, the Arabs can do the same. Jerusalem will remain the united, undivided capital of Israel. The Jewish link to Israel is 3300 year old. It is the land of our forefathers, Abraham, Yitzchak, Yaakov, and the prophets. The Jewish people have suffered much over the centuries. "Some people claim" that Israel arose because of the Holocaust, but if Israel had existed in time, there wouldn't have been a Holocaust. Our rights to Israel are not from the Holocaust. It is our right to build our nation in our land. It is our land, our birthplace. We don't want to rule over the Palestinians, and their presence in the land has caused debate and disagreement within Israel, but more unites Israel than divides us. Any Palestinian State must be completely demilitarized. Otherwise, what happens from Gaza will happen in the middle of Israel. And we want peace. The Palestinians cannot be able to make Peace treaties with our enemies, or threaten us. On this the nation is united. I request from the US, that the PA be completely demilitarized, with no weapons, and no armies, and certainly not like what is in Gaza. Without that, another Hamastan will arise, and we cannot and will not allow that. I told Obama if we can agree on these basics, the rest is semantics and can be resolved. And if the Palestinians can agree to this and dismantle Hamas, then they can live side-by-side with the Jewish State. Jerusalem will remain united, and Israel will have secure borders. We have no intention of building new statements or expanding them further. But we won't block natural growth either. The settlers are not our enemies, or the enemies of peace. The settlers are our brothers and Zionists. If the Palestinians were to stop incitement, stop educating to violence, stop violence... we will do our part. But the Palestinians needs to make a decision. Do they want Peace, or do they want Hamas? The PA must take over Gaza from Hamas. Israel won't sit with terrorists calling for our destruction. Gilad Shalit must come home healthy. Even the Red Cross can't visit him. In 61 years Israel has built miracles, our technology, medicines, research, agriculture are used throughout the world. If only our neighbors were willing, we could do miracles together with them too. Like Begin and Sadat, I call on the Arabs nations to make Peace. Excellent speech. I hope the Right is smart enough to support Bibi so he can stand strong on the fundamentals he stated. If you want to get a sense of what the Jblogosphere thinks about President Obama's speech, the shooting at the Holocaust museum and more go read Haveil Havalim #221 The News and Politics Edition. So what will Prime Minister Netanyahu say this evening at the much anticipated "Bar Ilan" speech? On the eve of Prime Minister Binyamin Netanyahu's speech in which he is supposed to outline his government's strategy with respect to the peace process, the Palestinian Authority said it would not accept any solution that does not include an immediate halt to settlement construction and the establishment of an independent and sovereign state. Unfortunately, these PA demands dovetail identically with those of US President Obama, who said that all of Israel's "illegitimate" settlements in the West Bank, including those around Jerusalem, "must stop". Obama also called for "2 states"...which is what the PA says is "the establishment of an independent and sovereign state." Haaretz reports that instead of focusing on the Palestinians, Netanyahu will discuss the dangers of a nuclear Iran -- and the election win of Ahmadinejad makes it all the more easier for this to be the majority of his speech. Prime Minister Benjamin Netanyahu is expected to devote a more significant part of his greatly anticipated foreign policy speech to the Iranian threat, officials close to the premier said, in the wake of Iranian President Mahmoud Ahmadinejad's electoral win Saturday. The officials added that this is a golden opportunity for Netanyahu to stress the issue before the world, after having called for years to stop Iranian nuclearization. The speech comes in the wake of tremendous pressure from United States President Barack Obama on Netanyahu to back the establishment of a Palestinian state and declare a freeze on West Bank settlement construction. Meanwhile, Netanyahu vowed Friday that he would not permit the establishment of a Hamas-ruled Palestinian state in the West Bank. "We will not allow the establishment of a Hamas state in the West Bank as well," Netanyahu told the European Union policy chief Javier Solana in Jerusalem. My take? I don't think there will be anything too significant in this speech; Netanyahu will not stop settlement construction -- it won't be our heyday of construction, but it won't stop. And in terms of the Palestinians, I have full faith that whatever gestures Netanyahu will come up with, they will ensure that terror will follow. A robot snake, capable of recording video and sound on the battlefield, is on the way to join the the IDF's hi-tech arsenal. This DARPA (Defense Department Advanced Researce Project Agency) robot is also rather amazing...it can walk on just about any surface. I just read the strangest article (in print, in Hebrew, no online link). What is even stranger was that when I mentioned it to Jameel, he already knew about it, and of course had even more details. The Jewish community is familiar with Crypto-Jews, such as those from Spain, also known as Marranos or Conversos. These are Jews who were forced to hide their religion, but continue to practice it (or parts of it) in secret, passing down bits and pieces to their descendents. But it seems their might very well be Crypto-Jews living in the Land of Israel – looking and acting like Muslim-Arabs! The article describes an Arab Hamula (clan) which lives near Hebron and who claim to be Jewish. It all began years ago when a local Jewish resident saw an old Arab on the road that looked exactly like a well-known Sephardic rabbi. He approached the Arab and asked him who he was, and that old Arab guy started to tell him his family's story. He claimed to be descendants of Moroccan Jews who arrived in Israel in the 1600s. Their original family name was Amsallem. After nearly the entire family was wiped out by Arab raiders, the survivors adopted the external appearance of Muslim Arabs to save their lives. They have certain Jewish traditions/rituals they follow in secret, and of course they pass down the knowledge they are Jews to their children. True or not true? Who knows. But the stories gets even weirder. In 1948, 35 Jews were massacred in Gush Etzion. They become known as the “Lamed-Hey”. They were killed by Arabs from the town of Tzurif. What is interesting is that Arabs from this town apparently have a tradition that they are descended from Jews going back to the Second Temple period, and at some point they were forced to convert to Islam. Supposedly in their homes they have various unusual customs that point to remnants of Judaism (such as a pseudo mezuzah, and brit mila at 8 days). And more interesting is that supposedly other Arabs also consider them to be descendants of Jews. Apparently the legend of Jewish descent is linked to some of the most violent, terrorist laden, religiously strict clans in the Gush Etzion/Hebron region. And the alleged reason why they are so extreme in their religion and violence? To prove to their fellow Muslim Arabs that they really aren’t Jews. No, this isn't a Green Helmet Guy Reuter's photoshop job -- the Muqata Blog has hit a major milestone today; Over one million page views of content from the Muqata blog have been viewed since its inception on June 5th, 2005. Removing my own IP addresses from the pageview counter, so that when I view the blog -- those views are not counted. Heck, even the JPost's article about the muqata got the hyperlink wrong, so I didn't benefit at all from the "easy click through" on line readers. OK, I cringe a bit when I read those first few posts. The Disengagement was almost upon us, and unfortunately, the same feeling of uncertainty is back in the air now. Tons more. Maybe I'll get around to adding keywords to the old posts, and organizing everything. the Muqata war crew (Joe and Litvshe), Sarah the awesome banner creator, Ezzie -- co-gabbai of many projects, Jack the Waffler, the Stern Gang (Apple, Erachet, Curious Jew), Lurker, DoubleTapper, Aussie Dave, TAFKAPP, RenReb, Trep, Akiva, Scraps, TikunOlam, Shifra, OM, XGH [or whatever he's calling himself now], Dovbear, YMedad, RWAC, Psychotoddler, TOWIK, SoccerDad, Kasamba, Commenter Abbi, Special Ed, BOTH, AddeRabbi, MCAryeh, Crazy Cat Cousin, LoZ, Ben-Bayit, Ben-Chorin, JCop, MoI, IsraeliSoldiersMother, Robert Avrech, Jewlicious, Esther K, the Loag, R' Gil, ProfK, Orthonomics, Raggedy Mom, ALN, FrumSatire, Jacob DaJew, Chardal, Mevasseret Zion, Our Shiputzim, Rafi G., Juggling Frogs, The (defunct?) Maggid of Bergenfield, Neshama, Chana, nmf#7, staam, and all the guest posters and commenters -- past, present, and future, and all those who mention things to me from the blog after shul, those of you I've had the pleasure of meeting in real life and virtually. If I've left you off the list -- or if you aren't simply on the blogroll and wish to be added, please drop me an email. (I'm sure I forgot someone important on this list...and will pay for it later). If you had a favorite post, please let me know...drop it it the comments. Shabbat Shalom -- see you around the JBlogopshere. Elliot Abrams, a former senior official in the Bush administration has this to say about the Bush administration's actual position on "Natural Growth". "For the past five years, Israel's government has largely adhered to guidelines that were discussed with the United States but never formally adopted: that there would be no new settlements, no financial incentives for Israelis to move to settlements and no new construction except in already built-up areas. The clear purpose of the guidelines? To allow for settlement growth in ways that minimized the impact on Palestinians." Can it be any more clear than that? Terror link to Doomed Air France Jet? Two passengers with names linked to Islamic terrorism were on the Air France flight which crashed with the loss of 228 lives, it has emerged. French secret servicemen established the connection while working through the list of those who boarded the doomed Airbus in Rio de Janeiro, Brazil, on 31 May. Flight AF447 crashed in the mid-Atlantic en route to Paris during a violent storm. While it is certain that there were computer malfunctions, terrorism has not been ruled out. Islamic terrorists? Maybe France needs to open a new page with them as well. What happened behind the scenes in the Knesset? A lot of excitement went on behind the scenes in the Knesset this past week that was completely missed by almost all of the Israeli press. The Knesset voted this week on who its representatives would be on the Judicial Appointments Committee. The JAC is composed of 9 members, including an MK from the government and an MK from the opposition. The makeup of this committee is important, as Israel will soon be selecting new Supreme Court justices, and this is a unique opportunity to open up the Supreme Court to justices who do not exclusively follow in the footsteps of Aharon Barak's far left and judicial activism policies - something the Supreme Court has been stacked with these past years. The Knesset voted for the candidates in a secret ballot. Representing the opposition candidates were Kadima's Roni Bar-On and Ichud Leumi's Uri Ariel. Leading up to the elections, Kadima was loudly claiming that the opposition candidate selected must come from the largest opposition party in the Knesset. This led to the absurd situation where Likud's Ruby Rivlin stated that he would vote for the left-wing Kadima's candidate. Ditto for Likud's Michael Eitan, and possibly Benny Begin too! This led to other horse-trading back-door deals with the religious parties regarding the committee appointees for the religious courts. In short, the left-wing Kadima party's candidate should have been a shoe-in, which meant the opportunity to finally balance the Judiciary would have been much more difficult, if not impossible. But among other things, and unlike Kadima's claim, opposition candidates only came from the largest opposition party 3 times in the past 17 Knessets - and not every time as they claimed. In the end, everyone started accusing of Kadima of lying and breaking the back-door deals (Bayit Yehudi's candidate suffered a surprise loss to UTJ's in the religious court committee) - which ultimately backfired and resulted in the Kadima candidate losing. But again, that isn't the whole story of what actually went on behind the scenes. This committee selection was actually going to happen very quietly. Kadima's candidate was a done deal, and the Right was actually going to throw away the opportunity to unstack the Judicial deck. Until along came activist Susie Dym with her Mattot Arim organization, and started ringing the fire bells. She woke up the Likud MKs to the real facts and significance of the vote. But more importantly, she woke up the citizens and got them involved. In the period of a few hours, relevant Likud Knesset members received a tremendous number SMSes demanding that they do not vote for the Left wing parties candidate in the opposition. In fact, they received so many (rumor has it at more than 100,000), the Likud MKs contacted Susie Dym, and begged her to get her activists to stop SMSing (which she did). Sources indicate, that more than anything else, it was this Shock&Awe SMS campaign that woke up the Likud Mks to the importance of this vote, and for voting the right way. Concerned Citizen Activism at its best. 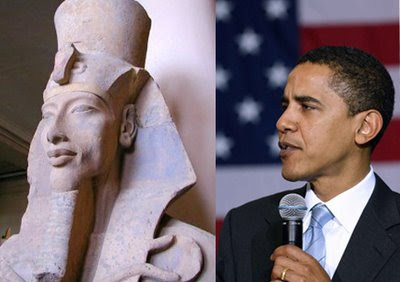 Obama and Pharoah -- Seperated at Birth? The following comparison photos are flying all over Israel's internet. Do you see the comparison? All these youth groups meet up on Shabbat afternoons, and its always a challenge to find interesting activities. The "Our Shiputzim" blog mentions the game “Ein Zahp” (which I admit, I've never heard of) and that got me thinking about the games we used to play back then. Zoom, Schwartz, Mafigliano, No Dice. This was orally transmitted to the Melbourne Australia Modern Orthodox Jewish Community in 1974, by an Jewish Educational Outreach Team from Yeshiva University who ran a programm known as Counterpoint. Zoom – Can only be done to one of the 2 players immediately adjacent on either side. When a player is Zoomed, the Itness (ie the concept of being It) passes to them. Schwartz – Can also only be done to one of the 2 players immediately adjacent on either side. But when a person is Schwartzed, the Itness passes to the player to the other side of the caller. No Dice – A player who is Mefiglianoed (but not one who is Zoomed or Schwartzed) has a fourth response option, ie by saying No Dice, in which case the Itness remains with the previous player. One does not have to look, or point while saying No Dice, because it is essentially a blocking move. (Some have the practice of crossing their forearms in front of them to illustrate the blocking nature of the move - this was observed at a game in Caulfield in December 2008- but it is not essential). A player can No Dice successive Mefliglianos only twice – if they are Mefiglianoed a third time, a full transfer of the Itness is deemed to have then taken place, and they now must respond with one of the 3 other calls. Players very commonly respond to a Mefigliano with No Dice – so that it is virtually expected. Hence making one of the other 3 responses instead is a strategic move because it can catch other players off guard. Apart from that restriction, in contrast to some other versions, there are no other restrictions on how many times a person can make the same call in succession. This can also be used strategically eg repeating Zoom many times in succession allows you to catch other players off guard when you unexpectedly change the call. There are also no restrictions in the order of calls including the starting call (though Zoom does tend to be the most commonly used starting call). Play continues until all but 2 are out, who are then declared the joint winners. Those counterpoint volunteers who went to Australia in the 70's, were considered the best of the best in Jewish Outreach. Back then, it was revolutionary -- which paved the way for today's Counterpoint programs which are all around the world. Of course other games included Clue, Mille Bornes, Stratego, Monopoly, Life, and Othello. What games did you play on Shabbat afternoon....? JPost Discovers "The Muqata" and "Israel Matzav"
DovBear's not the only one who gets recognized. The JPost had a nice write up about "The Muqata" and "Israel Matzav." hat-tip: Holy City Prayer, our kids' dentist, and the Simpsons. Last Friday there was a horrendous traffic accident on Road 55 in the Shomron Region of the "West Bank", among the worst I've been at as an EMT first responder. The call went out that a "minor" accident took place between multiple vehicles, and as I ran to my car to respond, our dispatcher announced that the accident was "upgraded" to "extremely serious." We checked the contorted victims in one car's backseat with a monitor, and they were all dead. Another car contained 2 who were still alive, yet it was impossible to remove them for transport since the doors were crushed shut. Help continued to pour in around us. Magen David Adom ambulances, settlement fire trucks, IDF jeeps, Israeli police cars, and first responders from around the Shomron converged on the accident scene. Did I mention that all those involved in the accident were "Palestinian?" No, I didn't because we respond to all medical emergency calls, 24 hours a day, regardless who the accident victims are. As the Israeli firemen frantically used the "jaws of life" to break open the crushed vehicle, Red Crescent ambulances and a Palestinian firetruck arrived as well. Deferring to the more experienced medical personnel of the IDF and Magen David Adom paramedics, the Red Crescent EMTs worked side by side with us to administer treatment to the accident victims. Speaking in English, Hebrew, and Arabic, a cooperation and professionalism borne from necessity pushed aside any political differences. The Palestinian fire truck connected a tow cable to the crushed car, and pulled it back enough so we could extricate another person from the car. After loading the person onto an ambulance for transport, I took a step back to survey the scene. I've been present at accidents before where there was cooperation between Jews and Arabs in the West Bank. This wasn't the first time I've worked side by side with Palestinian Red Crescent EMTs. However, what struck me as unique was the teenage volunteers. Teenagers in Israel volunteer for a myriad of activities -- among the popular ones in the settlements are Magen David Adom emergency medical service, and the Fire Department's Fire and Rescue service. These teens spend their free time helping others in some of Israel's most mission critical assignments; saving lives. These teenagers came as part of the ambulance and fire rescue crews and cooperated fully, professionally, and ethically -- as one would expect. These same teenagers were the exact same ones on the Outpost hilltops...the Ramat Gilad hilltop I posted about last week. The same teenagers vilified by Israel's Leftist establishment. The same settler teenagers who build the land and defend the land, are the same ones who save lives...of Jews and Arabs alike. Haaretz's Gideon Levy can't stand that anyone has a good word to say about settlers, which is why the following statement blew his mind. That statement was made by none other than Police Major General Shlomi Katbi, outgoing commander of the "Shai" region (Shomron and Yehuda; "West Bank"). Knowing the source of the denigration, he threw his barbs at Tel Aviv, who described his his words, "whose willingness to contribute to the state is one big zero." Katbi, who will retire from the police force after 30 years of service, launched a lengthy verbal diatribe against "those who sit in Tel Aviv, park their jeeps on the sidewalk on Sheinkin Street, drink espresso with one foot resting on the other, and allow themselves to level criticism and to tell stories." Personally, I know many people in Tel Aviv who do contribute to Israel -- but they aren't the ones castigating the settlers around the clock. Tel Aviv is the oasis of normalcy in an insane country. Between the espresso and the SUV arise art, culture, finance, science, intellect, media, openness and a healthy (albeit insufficient) introspection of the State of Israel, without which it has no real backbone. May God protect Israel if, heaven forbid, it ever turns into Yitzhar: violent, isolated, conservative, religious and backward. May God protect it if the majority of its police officers think like Katabi. Yes, we sit with out legs crossed on Sheinkin Street, sip espresso, and some of us even park our SUVs on the sidewalk. But at least it's our sidewalk, not a stolen sidewalk that belongs to another nation. It's time to call a spade a spade -- the Palestinians consider Giedon Levy a settler just as much as me. While the settlement I'm living in wasn't stolen from anyone, and was "State's Land" before 1967, without any private person living on it, Tel Aviv, and many of the Leftist hideouts in pre-1967 Israel were Arab villages. Israel's founding was turbulent and difficult, but to dump all of Gideon Levy's guilt on the settlers is totally hypocritical. Levy's "willingness to contribute to the state is one big zero"...as opposed to the settlers.